The top-of-the-line sport quads are pretty featured-filled these days. They have electronic fuel injection, fully adjustable suspension and powerful engines. One thing they don’t have (except the Yamaha Raptor 700 SE) is a speedometer. Furthermore, about the only instrumentation they do have is a gear indicator and a couple of warning lights. Cost factors and weight savings are most likely the reasoning behind this. What if you could see a speedome- ter, odometer, water temperature, bat- tery voltage and a lap timer all in one lightweight, low-cost unit? With the Striker dashboard from Trail Tech, you can have that luxury and more. We have been modifying our old Suzuki LT-R450 lately because we are tired of waiting for Suzuki to come out with a new one, so we contacted Trail Tech and ordered a variety of parts to help us do just that. The Striker is Trail Tech’s most affordable device of this kind and sells for $110. On the other end of the scale, Trail Tech does offer the more advanced Voyager system that features GPS tracking, mapping, speed, distance, temp gauges and more for $280. The Striker installs easily by using the supplied plastic handlebar mount, bolting it to a flat piece of bodywork, or mounting it more permanently to a $60 Trail Tech aluminum dashboard or complete $120 handlebar-clamp cradle. The handle bar-clamp product comes with a new plastic pod that holds the stock gear selector and warning lights. The han- dlebar mount we installed allows us to also use larger 1 1⁄8-inch fat bars. Trail Tech sells their own bar called X bars, which sell for a reasonable $50. Three different bends are available for ATVs, as well as come in black, silver, blue and red colors. To calculate the speed your quad is traveling, you have to route a wire down to the front spindle. Here, the end of this wire gathers information from a magnet that you install in place of any single brake-rotor bolt. As the magnetic bolt rotates by the Trail Tech sensor, it sends a signal through the wire and is routed back to the unit. Water temps are gathered via an inline coupler installed into the radiator hose. The unit is powered by the quad’s 12-volt battery, and the entire installation and setup on our Suzuki LT-450 took under an hour. -To gather speed and other movement data, you have to route a pick-up sensor down to one of the front wheels. On the Suzuki, we swapped out a brake sensor. That sensor is mounted on a bracket bolted to the spindle. All of this hardware is supplied. 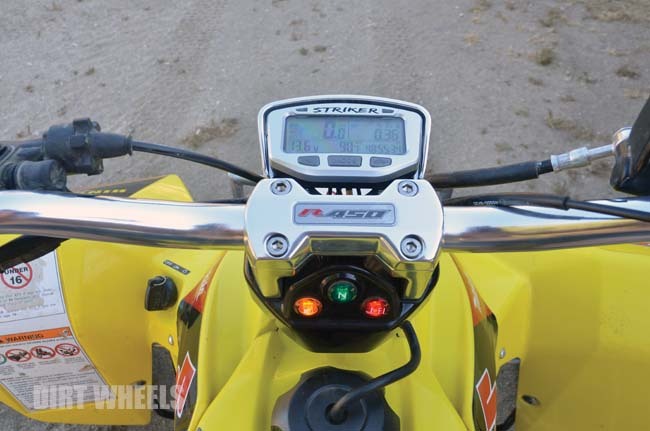 Not only is it fun to see how fast your quad actually goes, any speedometer is a helpful tool when working on your quad’s gearing or checking the performance of any motor mods. If you spend $3000–$4000 to get your motor built up, you want to have proof that it’s faster. You can check that by timing how fast it takes you to get to top speed or see how fast your quad can go with even taller gearing. -Water temps are gathered by installing this coupler within the stock radiator hose. The install only takes a couple of minutes. It takes much longer just to remove and replace the Suzuki’s body work. Keeping an eye on precise engine temps is just as important. If your quad is constantly running over 200 degrees, that might alert you that a fan might not be working or something is wrong with other areas of your cooling sys- tem. A cool-running motor is a fast motor. But remember, you don’t want to be hard on the throttle until the engine warms up and reaches 150 degrees. Just as important for today’s full-inject- ed quads is keeping an eye on battery voltage, and the Striker will help you do that too. The important data of speed, voltage and temperature is all saved in the Striker’s computer, so not only can you see how the machine is running while you are riding it, you can come to a stop and view the maxi- mums of those functions on a particular ride. If there was a Striker on every one of our test quads, our job would get a lot easier. If you want to upgrade your sport quad with these important data- acquisition functions, contact Trail Tech at (360) 687-4530, or see the rest of their innovative products by checking out www.trailtech.net.